​A merry band of us made our way across to the Peak District on the Friday evening to Brunt’s Barn at Grindleford. A few came down and met us at the work site in the morning, there being a total of 12 volunteers at some point over the weekend. The forecast wasn’t that good, but we all made it and didn’t back out and the rain didn’t take that long to start. On Saturday morning we were met by Harriet and Lloyd, the Park Rangers, who took us to the work site at Furness (aka Horseshoe) Quarry, a disused limestone quarry that is now owned by the British Mountaineering Council (BMC) for use as a climbing venue, situated within the Stoney Middleton Dales SSSI. ​Our work consisted of cutting back any trees or scrub that was slowly invading the site. 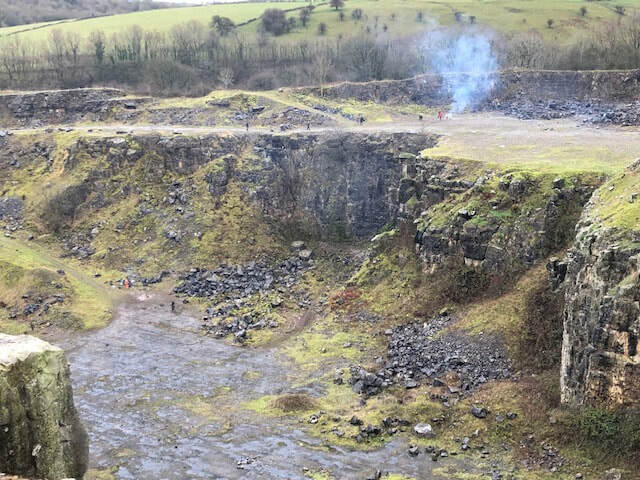 BMC are managing the quarry with wildlife in mind and want to keep the bare open grassland with its many tall herbs, grasses and orchids. 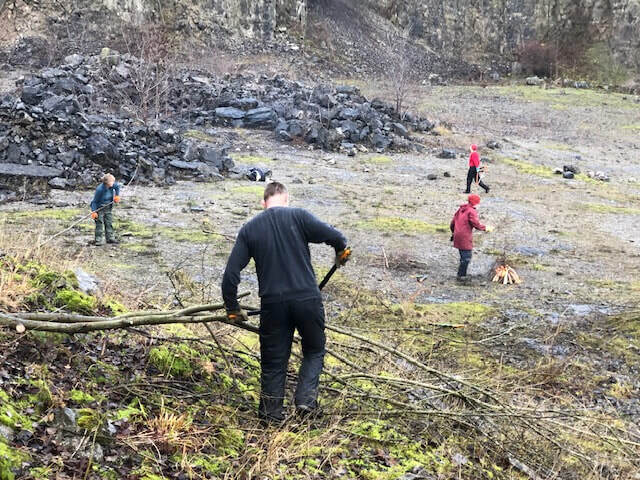 ​We worked at the bottom of the quarry on the Saturday cutting back the invading hawthorn, ash, sycamore and a few other species of trees but leaving the any dog rose. A bonfire was soon lit and blazing - just as well as we had drizzle throughout most of the day. ​I ran two sessions of somatics when we got back to the Barn to help relieve aching muscles caused by the hard work, which seemed to go down well. Nick had dinner planned and shopped for, and everyone else did a shift of chopping, cooking, warming, table laying and/or washing up. Sausage, mash, two veg, fruit pies and custard were produced and consumed and we still managed a few after dinner chocolates. 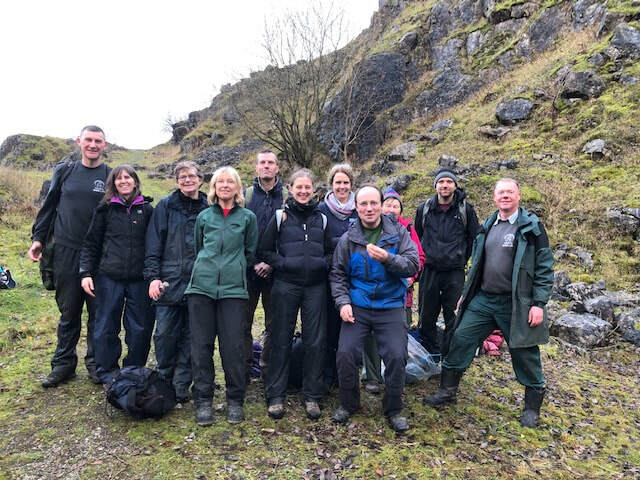 ​Sunday, we went out with rangers Lloyd and Zena to the same site but part way up the quarry to another open area and made an impression on the trees sprouting out between the rocks and again had a fire. The weather was drier thankfully, but the fire was still a welcome warmer at break time, as were the cakes that Anne and I had Anne made, neither of which had even a crumb left. ​It was good to see Maria, who moved to Sheffield a while ago but came out and helped us on the Sunday and caught up with everyone. ​​A thoroughly great weekend away; we may have eaten way too much cake and drunk too much but worked off all those calories with all the hard work. Thanks for organising this, Nick.